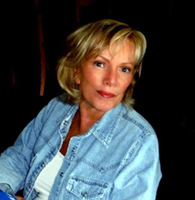 Gail Williams is an award winning art jewelry designer working from studios in Lake Lure, North Carolina and Sarasota, Florida. 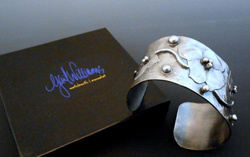 Her unique metalwork designs incorporate numerous traditional metalsmithing techniques, creating pieces that have a vintage, almost Art Nouveau feel to them. At the other end of the spectrum, her hand painted enamel pieces are colorful and bold with designs stemming from her paintings. Whatever the medium, gail has always been strongly influenced by the natural world, concentrating on both botanical and animal inspired designs. Her jewelry speaks to those who seek uniqueness, appealing to those favoring hand-crafted over mass-produced. "I have always been an artist, a painter. I found my love of Metals after taking a silversmithing class at a local Craft School." I have since studied with many amazing Jewelry Artists. Each helping to develop my own unique style. Creating work using the technical skills I have developed, Learning to design pieces that blend imagery with the architectural structures. I find joy in creating pieces I love and want to wear myself. "My jewelry is for the person who seeks uniqueness; It is for the wearer" My goal is to design jewelry that might be worn everyday such as a silver bracelet or pendant. Along with pieces for occasions that call for something special , a piece that you just can't wait to find an excuse to wear. My greatest compliment is when someone incorporates one of my jewelry designs into their own unique style. Copyright © 2018 Gail Williams. All rights reserved.